National Girl Scout Day is Celebrated on March 12. It begins a whole week of celebration of the Girl Scouting movement (March 12-18.) I thought it would be fun to share some Girl Scout facts and mark the day with a whole collection of recipes based on Girl Scout Cookies. It is nice to see a National Day devoted to organizations that do a lot of good and build character in young people. Don’t know what national days are? Find out more about these special days in my National Days Guide. The Girl Scouts was founded over 100 years ago in 1912 by Juliette Gordon Low when she organized the first Girl Scout troop, in Savannah, Georgia. The group is truly an American organization having been chartered by the US Congress on March 16, 1950. Here are some more facts about the Girl Scouts and National Girl Scout Day. This year marks the 106th year of Girl Scouting. There are almost 2 million girl scouts and the organization also has over 800,000 adults who act as volunteers. The Girl Scouts are found in more than 90 countries world wide. Were you a Girl Scout? You are not alone. More than 59 million American women alive today participated in the organization when they were younger! 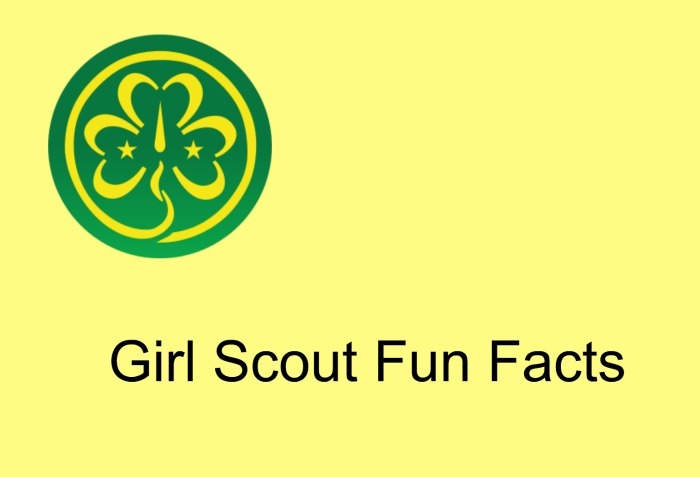 Girl Scout cookies were first sold in 1917 in Muskogee, Oklahoma. There is no connection between the Girl Scouts and Boy Scouts. Juliette Low was buried in her Girl Scout uniform. For another tasty food national day in March, check out Johnny Appleseed Day – March 11. National Girl Scout day is a chance to recognize a great organization that so many people remember fondly. What better way than to use their cookies in recipes? With so many Girl Scout Cookies, it is hard to know which cookie to feature! Why not all of them? One of my favorite memories early each year was the time that Girl Scout cookie sales were taking place. I used to buy boxes of them and keep them in the freezer. I don’t come in contact with them as often now, since my daughter is grown, but with the advent of so many food blogs, copy cat Girl Scout Cookie style recipes are all the rage online. Here are a few of my favorites. These delicious Samoas bars remind me of Girl Scout cookies with the same combination of flavors. They are very easy to make and super tasty! Make these Samoas macaroons by dipping caramel coconut macaroon cookies into Chocolate and then drizzling them dark chocolate. These individual sized Samoas Truffles give the taste of your favorite cookie in one delicious bite. Start your day off in a tasty way with these Samoas mini Baked Donuts. Tagalong Girl Scout cookies are a mouth watering treat that has a layer of peanut butter covered by a rich chocolate coating. 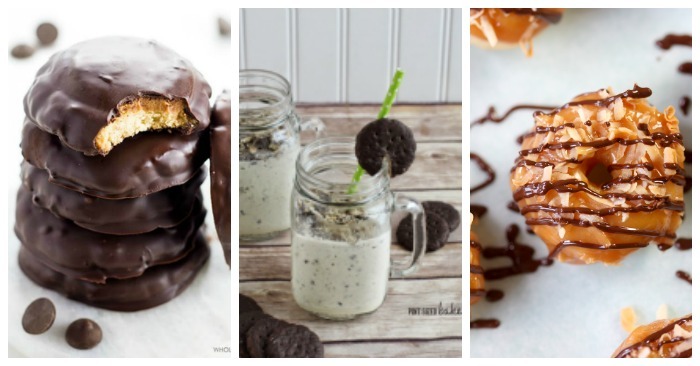 If this flavor combo appeals to you, try one of these Tagalong style recipes. This low carb, gluten free Tagalong cookie recipe from Wholesome Yum gives you all the flavor without all the carbs! Following a low carb or keto diet is easy with this Tagalong copycat cookie recipe. Turn the popular Girl Scout cookie into these Tagalong Brownie bites with peanut butter frosting from Garnish with Lemon. Use the flavors of Tagalong cookies to make these delicious Tagalong Cookie Bars. If you can’t get enough of the flavor combo, make a whole Chocolate peanut butter Tagalong Pie! This recipe for Tagalong cupcakes is low carb and sugar free to give them a healthier twist. This copycat Girl Scout S’Mores Cookie Recipe from Honest and Truly is the perfect cookie to take along on your next camping adventure! The toasted marshmallow topping for this copycat Girl Scout S’mores cookies will make you think you are sitting around a campfire! For a bigger version of the S’mores cookie, try making up a batch of these S’mores Cookie Bars. Who doesn’t love a Girl Scout Thin Mint? These round, mint-flavored cookies with a delicious chocolaty coating are one of my favorites! 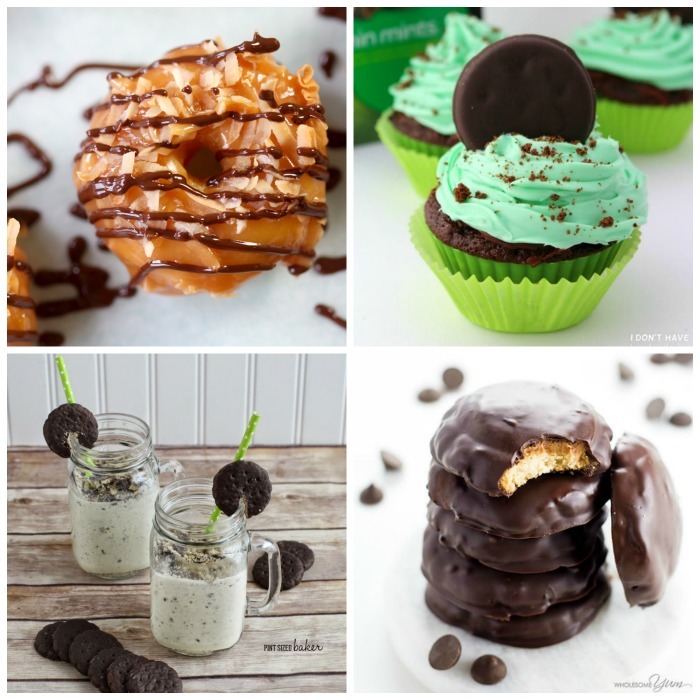 Thin Mint recipes come in everything from milk shakes to the cookie themselves. Get the flavor with one of these Thin Mint ideas. For a fun twist on a thin mint, try these Thin Mint Cake pops from Pint Sized Baker. Would you like your thin mint in a drinkable form? Check out this Thin Mint Cookie Milk Shake. Turn those thin mints into a Thin Mint Cupcake recipe with this tasty idea. These adorable Leprecaun Hat Cookies use Thin Mints as the base. So Easy and delicious! For a cool summer time treat, try this Thin Mint and Chocolate Chip Ice Cream. Girl Scout Shortbread Trefoils have the shape of the Girl Scout Icon pressed into them. The classic trefoil cookie is uses as a base for making this amazing Shortbread Trefoil Chocolate Bark Recipe. Trefoils get crushed and them combined with cream cheese and cheesecake pudding in this Trefoil Cheesecake Cup. Make your own Trefoil shortbread cookies with this easy recipe. They don’t have the trefoil impression but do have all the flavor! Do-Si-Doh Girl Scout Cookies are a sandwich cookie that gives you a crisp and crunchy oatmeal outside and cream peanut butter center. Start your day off with the taste of peanut butter in a Do-Si-Doh Smoothie. If you can’t eat wheat, try baking a batch of these Gluten Free Do-Si-Doh Cookies. Girl Scout Lemonades are perfect for summer! These crunchy shortbread cookies have a tangy lemon icing. The tangy taste of these cookies gets turned into Lemonade Girl Scout cupcakes in this easy recipe. If gluten is a problem for you, this Gluten-free Lemonades cookie recipe is the answer! Savannah Smiles are zesty, lemon-flavored cookies which have been dusted with powdered sugar. The crust of these Frozen Lemonade Tarts are made from Savannah Smiles Girl Scout Cookies. This Savannah Smiles blueberry parfait has crunchy layers of the popular Girl Scout– cookie along with fresh blueberries and lemon pudding. Get out the dusting sugar for this tangy Savannah Smiles Copycat Cookie Recipe. Thanks a Lot Girl Scout Cookies are a shortbread cookie with fudge on the bottom. They have the words “Thank you” embossed on the cookie as a show of thanks! Use this thankful Girl Scout cookie to make a Thanks a Lot Ice Cream Cake. It is the perfect summertime treat. Toffee-tastic Girl Scout Cookies are sweet and crunchy with little toffee bits that make up the cookie batter. This yummy Toffee-tastic cheesecake is the perfect special occasion dessert. Make your own Toffee-Tastic Copycat Girl Scout Cookies. Finally, rounding the list of Girl Scout Cookies are Girl Scout Trios. They feature chocolate chips in a gluten free peanut butter oatmeal cookie base. If you follow a gluten free diet, make your own Girl Scout Trios cookie at home with this recipe. Which is your favorite Girl Scout Cookie Recipe to celebrate National Girl Scout Day? Have you tried making it in a copycat recipe? If you can’t find Girl Scout Cookies in your area, many sellers on Amazon have them for sale.